With the festive season well under way, if you are holding an outdoor event or party, you may wish to consider hiring some patio, marquee or outdoor heating. London Cool specialises in the hire and sale of patio heaters across London, Surrey, Sussex and Kent.and our range of patio heaters will keep any outdoor area warm, ensuring your guests are kept warm and comfortable too. Our patio heaters come in four types to suit every type of outdoor entertainment space, including marquees or al fresco dining. 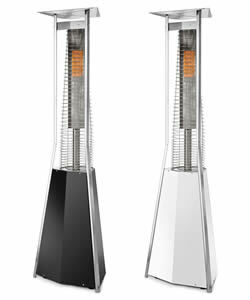 Particularly popular is the very stylish Santorini Flame Gas Patio Heater which will add a touch of elegance to your event. The heaters will be supplied with everything you need, including gas (at an additional cost).